Earn 4.8 SB per $ when you buy Brinker 4-Choice gift cards at MyGiftCardsPlus, powered by Swagbucks. Brinker International is the premier casual dining restaurant company in the world and has received numerous accolades through the years for its outstanding performance. 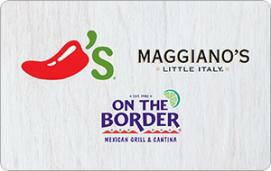 Brinker International has been called the "mutual fund of casual dining" - stemming from their powerful and unprecedented portfolio of outstanding concepts which includes Chili's Grill & Bar, Romano's Macaroni Grill, On The Border Mexican Grill & Cantina, Maggiano's Little Italy, Corner Bakery Cafe, and Rockfish Seafood Grill. Founded in 1975, Brinker International has grown to over 1,500 restaurants worldwide. Brinker International's mission is to be the very best in the business. Their game plan is status go ... they are constantly looking ahead, building on their strengths, and reaching for new goals.